Solar cells, or photovoltaic (PV) cells to give them their correct name, are used to convert light energy into electrical energy. The appeal of a solar cell is the promise of a clean source of energy that does not generate any harmful by-products, like greenhouse gasses. Whilst solar cells require sunlight to provide efficient levels of power generation GCell can use sunlight or artificial ambient light to create electrical energy. However, all solar cells use the same basic construction of using a semiconductor to conduct electricity under certain conditions. When a photon (a particle of light) hits the photo-sensitive or light-active component of the solar cell it excites the electrons allowing them to flow freely. The electric fields within the solar cell push the excited electrons to move in a certain direction. This movement of electrons is current (ampere). Placing metal contacts on the top and bottom of the solar cell, can direct the current for use externally. Together with the solar cellâ€™s voltage (which is determined by its built-in electric field), it defines the power (wattage) that the solar cell can produce. In the below sections we look at the different types and generations of solar cells. 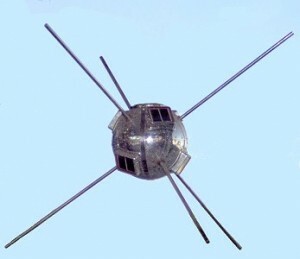 Vanguard 1 – the first satellite to be solar powered. The 1st generation of solar cells, typically wafer-based, date back to 1958 where they were used in the first satellites launched into orbit. Today now that they are more affordable they are widely used on rooftops and free-standing solar-farm systems around the world. Typically the 1st generation solar panels provide the most power per square metre of surface areaÂ under standard test conditions (STC); Temperature 25Â°C, Irradiance 1000 W/m2 (1sun), Air mass 1.5 (AM1.5) spectrum. However, low-light conditions and rising temperatures impact performance. Being silicon-based they are rigid solar panels that are brittle and fragile, not good for transporting or handling. They have extensive lifetime of 10-20years and can handle exposure to the elementsÂ very well. They are also one of the most energy intensive photovoltaic technologyâ€™s to manufacture because very pure silicon is required. 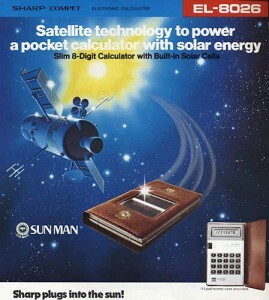 Sharp EL-8026 Â – the first solar calculator. The 2nd generation of solar panels include amorphous silicon (a-Si), Copper Indium Gallium Selenide (CIGS) and Cadmium Telluride (CdTe). Amorphous silicon cells date back to 1976 and were used on the worldâ€™s first solar power calculator the EL-8026 from Sharp. Today 2nd generation solar cells are used in a wide range of application from rooftops to textiles. Thin-film, so called because they use semi-conductor materials only a few micrometers thick, means they can be manufactured on substrates other than glass. This makes 2nd generation solar cells light-weight, easier to integrate and cheaper to manufacture. However, some 2nd generation solar cells use toxic materials and vital raw materials that are in great demand in other applications, for example flat screen displays, which could lead to long-term price increases. 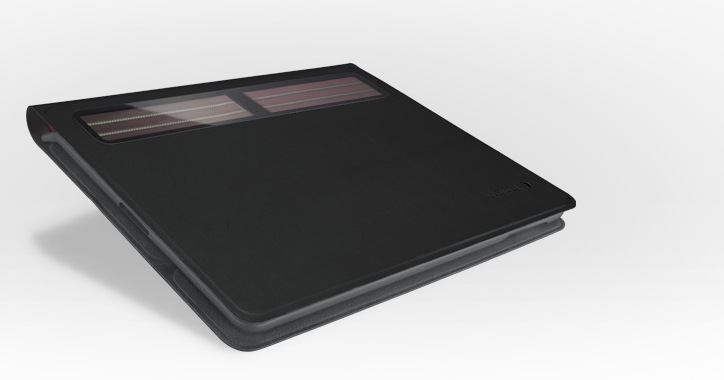 Logitech Solar Keyboard Folio – the first for iPad. The 3rd generation of solar cell includes dye-sensitized solar cells (DSSC) and organic photovoltaics (OPV) which use organic dyes and organic polymers respectively, to create a photoexcited electron from which energy can be harvested. The creation of DSSC dates back to 1991 and has been commercially available since 2006 through G24. With its indoor attuned chemical formulation GCell, by G24 Power, focuses on indoor applications where robustness, flexibility and easy integration are ideally suited to the growing portable wireless consumer electronics market. The future prospect of roll-to-roll manufacturing, cheaper materials, more stable molecular dyes and quantum dots, transparent and semi-transparent coloured solar cells, and greater power density creates opportunities for the use of GCell in large scale electrical solar power generation such as glass panes or cladding for buildings. +Â Prospects of lower-cost, long-life and greater power density.